Amanda… ready to take on the city! Once the only Florentine bridge across the River Arno, built at the river’s narrowest point, the Ponte Vecchio is made of stern stuff (and I’m not just talking about its stone construction), for not only do a jumble of tiny shops cling tenaciously like limpets to its buttermilk walls, it has withstood some floods, been rebuilt after other floods and more recently was the only bridge in Florence to avoid being destroyed by retreating Nazis during the Second World War. From a simple wooden bridge in Roman times to the stone construction of 1345, history has seen it reshaped to serve the needs of the times, and it is a symbol of Florence famous the world over. In the 14th century it was a hub for tanners, blacksmiths and butchers’ shops (the river was the ideal way to get rid of their waste). These noisome trades were evicted at the end of the 16th century when jewellers and goldsmiths took up residence, and so it remains to the present day. 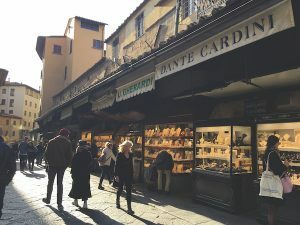 Linking the Oltrano, or south side, of Florence to the city centre, the 16th-century addition of the Vasari Corridor on top of the existing shops served as a discreet conduit between the Uffizi and the Pitti Palace to allow the Medici rulers to traverse the city in privacy and safety. Our home for the weekend is right here on the bank of the Arno at Hotel Continentale, an effortlessly glamorous design hotel with the bustle of Ponte Vecchio just feet away from its door. 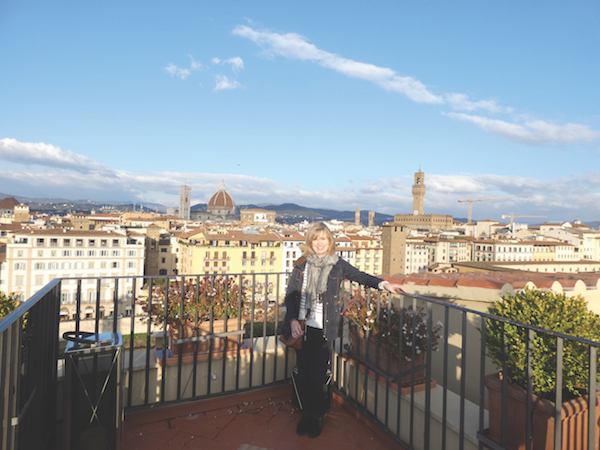 From my second floor window, magnificent views of the city’s terracotta rooftops unfurl towards the horizon and the Arno shimmers into the distance, snaking its way lazily through the city. From the street below, we are a short walk from Palazzo Vecchio and the Uffizi Gallery, Piazza della Signoria, Santa Maria del Fiore and Palazzo Pitti. We are well placed for our Florentine weekend adventure. But first, a spot of lunch. The Continentale is part of the quartet of hotels in the Lungarno collection here in Florence owned and curated by the Ferragamo family. Guests are encouraged to dine at any of them. 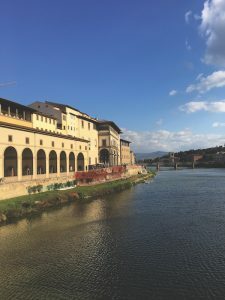 Joining the slipstream of shoppers thronging the Ponte Vecchio, we crossed over to the opposite bank where our reservation at the Picteau Lounge in Hotel Lungarno was waiting. Platters of Tuscan specialities like pappa al pomodoro, tagliata di manzo and tortellini a casa were presented in this relaxed blue-and-white space, setting a decidedly nautical theme with the waters of the Arno twinkling merrily through the double-height picture window. The Piazza della Signoria has been the hub of the secular life of Florence for centuries, the place for political gatherings. The Palazzo Vecchio with its distinctive Arnolfo tower is still the ‘Town Hall’ of Florence, with council offices, including one for the mayor, but its most magnificent rooms are now a museum. Built around the turn of the 14th century, it looks like a fortress from the outside, but was extended and the interiors renovated by Giorgio Vasari in the 16th century, when the Medicis held power, and Cosimo I made it his ducal residence. 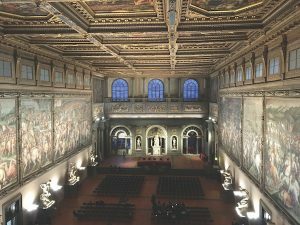 There is much to see, including the vast Salone dei Cinquecento with dramatic battle scene frescoes on every inch of wall and ceiling (more on that later). Visit the Map Room for Cosimo I’s outstanding collection of 16th-century cartography, a fitting collection for a nobleman with powerful political ambitions of his own. In common with most medieval palaces, the Palazzo Vecchio is threaded with secret passageways and hidden chambers, an escape route in times of political strife. If you have time, take a tour with one of the expert guides, who will lead you from the steep and winding stairway of the Duke of Athens, to the magnificent Studiolo (study) of Francesco I, and the Tesoretto (little treasure) of Cosimo I. The final flourish of the tour takes us to the trusses that support the magnificent ceiling of the Salone dei Cinquecento. This cobwebbed, musty, creaking space above the ceiling has a precarious ‘Jenga’ complexity to it; it was constructed entirely from wood by Giorgio Vasari (with a little help from Michelangelo) after Cosimo commanded that the original ceiling of the salone should be raised a further seven metres. When you consider the mighty ceiling beneath, it is breathtaking in its engineering and fragility. Not to be missed. In 1296 the Opera del Duomo (Cathedral Works) was created by Arnolfo di Cambio, the architect of the Cathedral of Santa Maria del Fiore (to give the ‘Duomo’ its full title) in order to oversee the ongoing construction of the Duomo and its interiors. Very much a practical workshop, it was the place where all the artisans and craftsmen could devote themselves to ongoing works for the cathedral itself. In the early 15th century it took up residence in another building at the east end of the cathedral, where, over 700 years later its modern reincarnation, the Museo dell’Opera del Duomo, is housed. Curating and conserving those works and their fascinating history, this superb museum opened in 2015 – the magnificent outcome of a €50 million building project. If you want to understand the history of the Duomo over the way, start your journey here; a tour guide is a must and you will leave with a much deeper appreciation of Florence’s magnificent edifice and the medieval visionaries behind it. 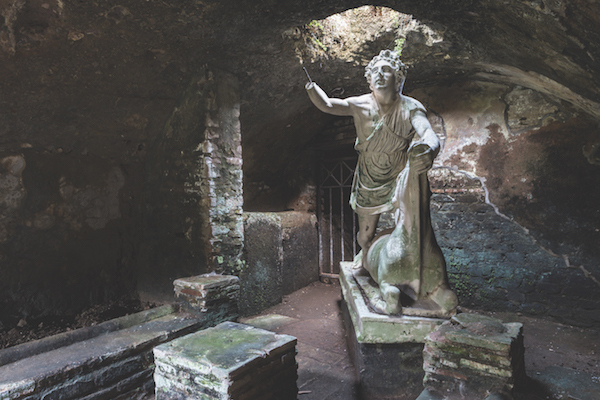 You immediately get a sense of the scale of the original vision in the first room you visit, a massive hall housing Arnolfo di Cambio’s restored cathedral façade and some of the statuary which was carved to go in its niches. Marvel at the Madonna with startling blue irises (made of glass to reflect the light and make the eyes dance) then turn around to take in the three-dimensional splendour of recently renovated gilded bronze Doors of Paradise by Lorenzo Ghiberti, taken from the Baptistery and housed here away from the vagaries of modern-day pollution and mass tourism. Everywhere you turn, there is a wealth of original art, mosaics and statues telling the proud history of the cathedral and Baptistery. I would single out Donatello’s La Maddelena (1453-55); carved in wood, the realism of the haggard features of penitent Mary Magdalene shocked its audience in the 15th century, yet it touches our modern sensibilities in a remarkably contemporary way. 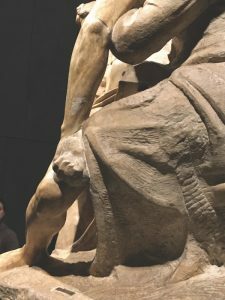 Michelangelo’s unfinished Pietà is also here: hooded Nicodemus is widely believed to be a self-portrait of the ageing artist, who possibly intended this sculpture for his own tomb. Take a closer look to observe how Christ’s lower limbs appear awkwardly placed. Was this an error of perspective made by the grand master in his declining years? Finally our guide takes us in the lift to the top floor. On the terrace outside, Brunelleschi’s magnificent Duomo is right there before us, almost close enough to reach out and touch its 14th-century cloak of russet-hued terracotta tiles. From close-up views of venerable buildings, it was time for a wider perspective on this glorious city as we drove through Oltrano in a buzzy little tuk-tuk. It bounced us all the way up Viale Galileo to the Abbey of San Miniato al Monte. Built over the shrine of 3rd-century martyr San Miniato, the basilica is a stunning example of Tuscan Romanesque architecture and a watchful sentry over the city below. Despite the abbey’s popularity on the tourist map, the interior is so peaceful, illuminated only by natural light filtering in from outside. Adorned with masterful medieval frescoes, artwork and mosaics, it is a place of stillness and contemplation, and a reflective respite from the bustle of the city centre. Look down on Florence spread out below, the orange roofs like fallen leaves and the dappled Arno criss-crossed with bridges, a lasting memory of this cherished Renaissance city.